Habit: Annual to perennial herb; hairs barbed to needle-like, not stinging; stems pale pink or generally +- white, branched or not. Leaf: linear to ovate, entire to pinnate-lobed; basal in rosettes, generally petioled; cauline generally sessile, +- reduced distally on stem. Inflorescence: generally cyme (or flower 1); bracts green to white, margin green. Flower: sepals lanceolate to deltate, persistent; petals generally 5, free, white to yellow or orange; stamens generally many, +- free, generally unequal, inner filaments generally thread-like; outermost stamens opposite sepal lobes generally modified, +- widened, or petal-like with anther or not; ovary generally cylindric, placentas generally 3, style thread-like, stigma 3-furrowed or -lobed. Fruit: capsule, cup-, barrel-, or urn-shaped to narrowly cylindric, occasionally curved. Seed: generally many, shape variable. Species In Genus: +- 100 species: western North America, +- tropical America. Habit: Annual 3--45 cm. Stem: erect, hairy. Leaf: 1--18 cm, lower lobed, upper toothed to lobed (entire). Inflorescence: bracts generally ovate, toothed to lobed (entire), base green to +- white. Flower: sepals 1--5 mm; petals 4--7(10) mm, obovate, orange to yellow, base generally red to orange; stamens 3--7 mm; style (3)3.5--6 mm. Fruit: erect to curved 40° (70°), 8--28 mm, 2--4 mm wide, obconic. Seed: 1--2 mm, irregularly angular, tan, dark-mottled, edges generally acute; seed coat cells generally pointed or domed, > 1/2 tall as wide on seed surface edges in age. Chromosomes: 2n=54. Ecology: Loamy to sandy desert, grassland, scrub, oak/pine woodland; Elevation: 200--2500 m. Bioregional Distribution: n SNH, Teh, SnJV, SCoRI, TR, PR, GB, D; Distribution Outside California: Oregon, Nevada, Arizona, Baja California. Flowering Time: Mar--Jun Note: Yellow-petaled forms generally restricted to pine/oak woodland, grassland. 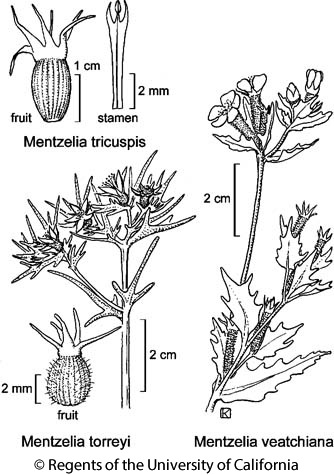 Intergrades with Mentzelia gracilenta, Mentzelia ravenii, Mentzelia montana, Mentzelia albicaulis. Citation for this treatment: Joshua M. Brokaw, John J. Schenk & Barry Prigge 2012, Mentzelia veatchiana, in Jepson Flora Project (eds.) Jepson eFlora, http://ucjeps.berkeley.edu/eflora/eflora_display.php?tid=33294, accessed on April 21, 2019.
n SNH, Teh, SnJV, SCoRI, TR, PR, GB, D; Markers link to CCH specimen records. Yellow markers indicate records that may provide evidence for eFlora range revision or may have georeferencing or identification issues. Purple markers indicate specimens collected from a garden, greenhouse, or other non-wild location.